- A True Gentleman -: Essential | Cooperstown Ball Cap Co. Essential | Cooperstown Ball Cap Co. In this small factory in the hills around Cooperstown, NY the Cooperstown Ball Cap Co. recreates ball caps of the bygone eras of baseball (1860-1930).Whenever possible the original machines are used. They sew 12-13 ounce wool athletic flannel, horsehide leather sweatbands with short bills (because that is what the real ones used). 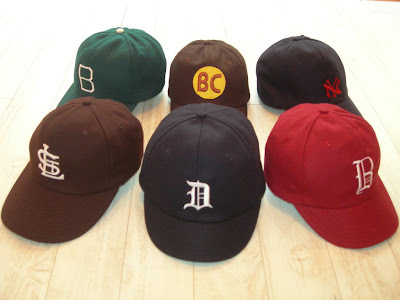 Hand made, in the old fashioned way, Cooperstown ball caps are quite possibly the nicest caps around.